Karnataka Examinations Authority (KEA) is conducting Karnataka Common Entrance Test (KCET) 2019 on April 23 and 24, 2019. Each year the number of applicants is rising; 1.98 lakh students had applied for the exam last year that was 11 per cent higher than the year before. When it comes to preparations, the first thing to be aware of is the exam pattern and syllabus. There are four separate subject papers of 60 marks, 80 minutes each – Biology, Mathematics, Physics, Chemistry. KCET syllabus is same as state board syllabus, that is, all questions in KCET exam shall be from the first and second PUC syllabus that has been laid down by the Department of Pre-University Education of Karnataka State. In the exam, all questions are multiple choice with four options, having one correct answer. Students get one mark for every correct answer. In KCET, there is no negative marking. In order to get a high score in KCET, students should prepare for the exam alongside their PU exams. Toppers recommend that just after you finish a chapter from your school textbook, practice its questions from a question bank or KCET previous year paper. 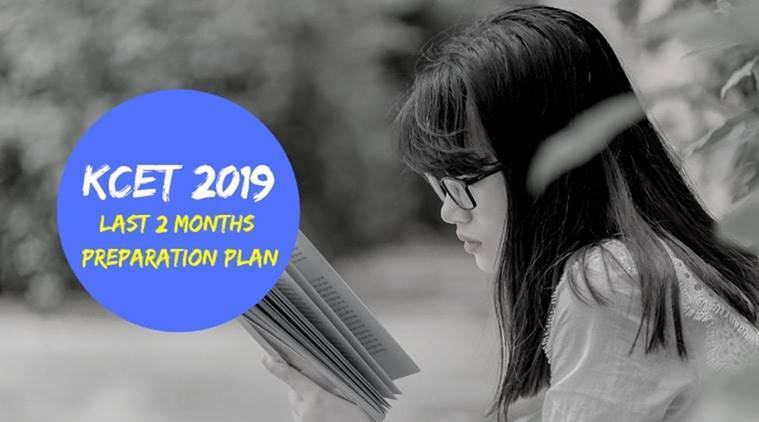 Students will get one month time even after board exams get over as per the Karnataka 2nd PUC Time Table 2019. This time also has to be utilized to cover up weak areas and make one’s strong topics even better. It is very important to understand the concepts of every topic. One can easily solve the MCQs asked in the exam if they have a firm grasp on concepts. Students should spend a sizable amount of time practising previous year question papers of KCET. By doing this they will – build speed, accuracy, and be mentally prepared for the level of questions. To solve 60 questions in 80 minutes, you get only 1 minute 20 seconds per question. However, you can spend more time on Mathematics, Physics, and few questions in Chemistry and Biology that require calculations. On the other hand, you have to devote very less time to questions that require memory based answers. So manage your time like this to maximize on the available time. In the last few days before the exam, revise all the formulae. Preferably this should be done from self-written notes. However even if you do not have any such notes, you can refer a book that has all the formulae in one place. Last two months should be majorly dedicated to solving questions – from books, previous year papers, sample papers, mock tests. When it comes to solving previous year papers, doing the past 5-10 years is enough. Too old papers may also not be very useful as the level of difficulty has slightly albeit gradually changed over the years. Engineering aspirants need to appear in PCM subject papers only. Whereas B.Sc, B.Tech (Biotechnology, Food Science, Dairy Technology, Food science and tech, Agriculture), BFSC have to appear in PCMB. BVSC and AH candidates have to appear in PCB. BPharm, BPharm, Pharm D aspirants can appear in either PCM or PCB subjects. Here is wishing best of luck to all of you for your exam. Candidates may also note that KCET 2019 Application Form Correction will begin on March 19, 2019, and be available until March 25, 2019. Thereafter KEA will issue KCET 2019 Admit Cardon April 16, 2019.